Starting in 2009, with a CNC machine rented at night in Germiston, TTD has been manufacturing CNC tooling mainly for the Automotive industry, specifically for BMW, Volkswagen, Nissan/Renault, Ford and Toyota. Today, based in Rosslyn, Pretoria, we have 3 CNC milling machines, with our largest able to accommodate CNC jobs of up to 3m x 1.5m .Our client base has expanded to include new verticals such as defence and aerospace. We have further expanded our plant to include a fabrication/maintenance area with various manual machines to support the operation. In an effort to assist our customers even further, we have taken our methodology into maintenance and fabrication. We now have a full compliment of maintenance staff to cover all your HVAC, Electrical and Plumbing needs. We routinely fix and service Phnematic and Hydraulic equipment, install all types of machines, build custom material handling systems and custom machines. We have complete turnkey instalations running where we have supplied all CNC tooling and checking fixtures, designed and built the part processing equipment, installed the machine and support equipment and continue to maintain them all for optimal operation. Tugwell Tooling & Design offers fresh thinking and those ahah moments... exactly what is needed for inspirational product design. 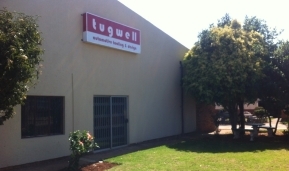 Having Tugwell on board has really enabled us to stretch our own capabilities, and achieve the tooling flexibility that enables us to chase down big deals! TTD has been supplying us with quality Checking Fixtures for Brake and Fuel Lines from plastic and aluminium for the last year. We are really happy with their quality and will continue to use their Plastic and Aluminium Fixtures for our South African Automotive clients.